Its a waste of time writing a review for this movie . 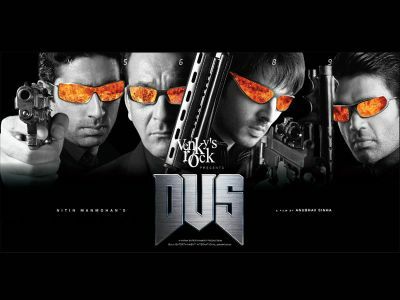 However since I have spent some bucks and some time in going to the theatre to watch DUS . Here is my list of DUS ( ten ) reasons why not to watch this movie !!! Sunil Shetty - Even the ramlila which plays in my locality has better actors . All he does is shout in the movie !! Also his colored streaked hair makes him look a "wannabe "
Riya Sen - " Mere bacho ko mat maro " " Mere bacho ko bacha lo " ...are the only 2 lines she has to say in the movie with conviction .....and guess what she makes herself sound Dharmendra !! Esha Deol - Her look in the movie makes you laugh ( infact this was the best paisa vasool part of the movie ) . She looks like a "lady Dharmendra" !! . She needs to act ...and fast !! Also I couldn't figure why she boards the plane in the end with small B ?? Dialogues - " Aap jab mere ko beta bolte ho ..to bada aacha lagta hai " ( tears roll down ) . " Cigarette main nahin pita" ( tears roll down ) .....Yeaah these are the moments which are supposed to be the drama element in the movie................wtf ?? Gulshan Grover - He borrows his dress and look from Osama and acts like someone out from the menal hospital with a tabla playing hangover !! The most pathetic attempt ever in creating a villain . Diya Mirza - Zayed Khan track - Guys if you are in so called loved in the movie ?? Why did 'nt you get married ? Or was it me too busy with the popcorn ? Shilpa Shetty - Has a stupid batman tatto just above her butts in the movie !! Guess what ...Bats can act better then her !! AB - Esha track - wtf....wtf....wtf......wtf !! A suggestion to the director ....He should have put in a romantic number in the Swiss Alps..maybe that would have worked for these 2 . What the hell is Venky ' s Rock - Whatever it is...they are not making money on this one for sure !!! Had it not been for these 2 , I would have written a HAZZAR bahaney NOT to see DUS ! !